Lewis Cooper helped St. Mary's College of Maryland finished 3rd competing in the 2019 GW Team Race despite a slow start this morning. The wind was minimal, but high water levels allowed for racing to be held in the lagoon to hide from the stronger current in the Potomac River. 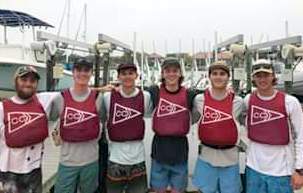 Cooper and his teammates would finish the six school Regatta with a record of 8 wins and 7 defeats after 3 Rounds. In Round One St. Mary's College of Maryland defeated Cornell, George Washington and Pennsylvania, while falling to Christopher Newport and Georgetown. St. Mary's College of Maryland would defeat Christopher Newport, Cornell and Pennsylvania in the Second Round, while falling to George Washington and Georgetown. In the Final Round St. Mary's College of Maryland defeated Christopher Newport and Pennsylvania, while falling to Cornell, George Washington and Georgetown.